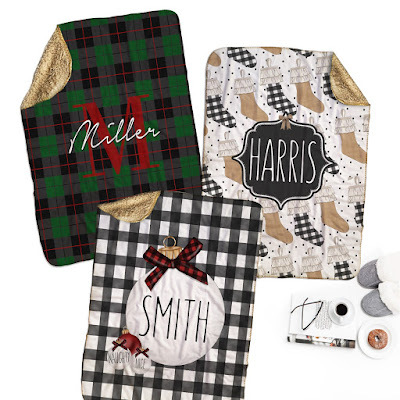 Love these Personalized Furry Fleece Plush Blankets $42.99. Personalized furry fleece blankets are gorgeous in person! A very high-quality item. -Large 50" x 60" size. -The top side features silken faux micro-mink and the backside is an ultra soft furry layer. -The high-quality blanket is professionally printed to avoid any fading and is made to last. -The blanket has a whip-stitch border. -Blanket is double layered which makes for a heavier overall weight. It will definitely keep you warm on chilly nights! -Machine wash separately in cold water. Tumble dry on low. -Personalization: We can personalize one line of text. Please include all words such as The, Family, etc.